"Da Ji is calling upon you to serve her in defending the last of the foxes! Protect the adorable vulpine critter from an unending assault of minions, Elite monsters, Bosses, and the Gods themselves to earn her favor! 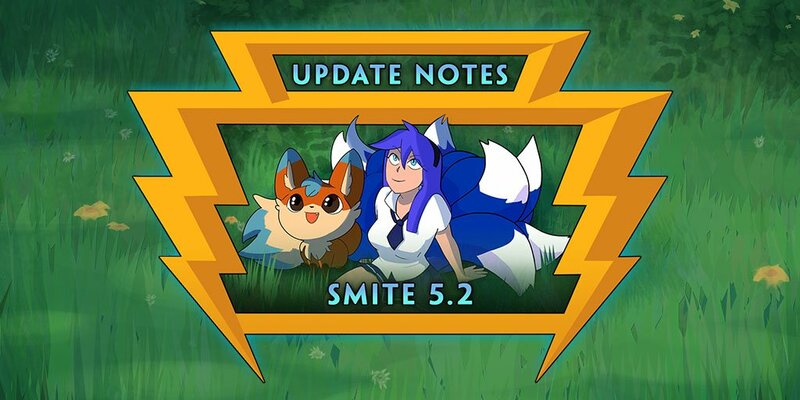 This new smite adventure is available in 5.2 through 5.4. For more information check out our Adventure site or FAQ!" "The changes to Conquest in 5.1 have created quite a few difficulties for Ares. His Abilities don't do much damage to lane minions, he has trouble killing jungle camps, and he has no mobility to help with rotations. All of these aspects have become even more important for Guardians. Ares is getting more minion damage on Shackles and lower mana costs on Bolster Defenses to help him better fill a traditional support role." "Through previous Seasons, Neith has survived through her strong abilities with less of a focus on her basic attacks. As SMITE has progressed it has become clear that even ability focused hunters need strong basic attacks. Neith's base power stats were nearly the lowest in the entire class, so we are bringing those up to let her basic attacks compete and add even more punch to her strong damaging abilities." "The new jungle respawn timers have put Thor in an awkward position. His fastest clearing ability is a channeled ability that does not immediately go on cooldown. This results in him often showing up to camps without being ready to clear them. The god of thunder is getting a cooldown reduction on his spin-to-win so that he can keep up with the pace of the Season 5 Conquest jungle." "Vulcan is one of the mages who was hit the hardest by the Rod of Tahuti re-design. He is most successful as a late-game extreme burst mage but he is now having a harder time bursting enemies down. His cannon pet cannot utilize a lot of the unique passives that mages are building into with the item slots opened up in Season 5. To bring his late game burst back up we are increasing the Magical Power Scaling on Magma Bomb." "In 5.1 we introduced a huge amount of item changes and re-designs. Mages had the most change, and many of their builds are still in the very early concept stages. However, one class and role had a clear outlier in its strength: Hunters with Critical Strike and Lifesteal. The following 3 items are being adjusted to address this build. Critical Strike is a difficult mechanic to balance. Our goal in 5.1 was to make Crit more consistent but deal less overall damage. We feel like the changes were a success, but the build path was clearly overshadowing other options so we want to adjust a few things slightly and make sure Hunters can enjoy just as much build diversity as the other classes of SMITE." "We felt players who purchased Deathbringer as their sole crit item were performing much better than we hoped. With the lower critical strike chance, players will have to build a more standard crit item before going right into this luxury item. Crit in general is a very polarizing mechanic. It has some randomness to it, but also can be very interesting. While we don't plan on completely redoing crit, we do want to continue adjusting crit items to make sure the build has unique strengths. Hunters and Assassins still have many powerful items they can use that we want to be comparable to crit. Expect more changes to Critical Strike items in 5.3, as well as some mage item adjustments." "This new Guardian item had interesting possibilities but too many limitations. We are adjusting the stacks on Talisman of Energy to reach the same total power but at a much faster rate. Now Guardians can empower their team with a boost of stats after every minion wave." "Midgardian Mail has fallen out of favor for quite a while. It has a very powerful and somewhat inconsistent passive but its stats didn't quite compete. We want to make sure that Guardians don't feel punished by picking up this item as a strong counter to fast attacking opponents." "Atalanta's bow has the movement speed to make it a unique physical item, but its damage stats and cost didn't earn it a spot in most builds. We are taking the cost down and bringing the Attack Speed up to help it better compete with other Attack Speed options." I can't be the only one that immediately thought of DeviantArt. We will be retroactively granting players Fox Chest based off the number of adventures games played. We will also be setting up the fox roll counter in the adventure to properly display the number of rolls till a guaranteed fox skin (if the player's don't already have it), and giving the fox if they've already exceeded the required number of rolls. And we will be redistributing the S4 League Reward Frames so that players have the correct frame. FIXED - Adventures pity counter not guaranteeing a Fox at 9 chest rolls. FIXED - Ragnarok not awarding Awesome Chests. FIXED - Da Ji's ability, Horrible Burns, did not give haste effect. FIXED - Esports banners in Conquest do not always match the badge used by majority. FIXED - Buying the last item in the Winter Athletics Chest awards a Winter Athletics chest. FIXED - Adventures Elite randomization logic is not working on round 4. FIXED - Loki dying in ultimate startup will cause next ult to hit the same target. FIXED - Gold Key quantity doesn't update after unlocking skin in gold vault. FIXED - Adventures End of Match Lobby always shows 1 star. FIXED - Cerberus' Oblivion Hound skin has armor that makes it incredibly hard to see that his heads are charged. Adventure Boss intro's were occasionally not playing fireball FX. Item store sometimes will not behave properly in non conquest game modes.